On Mozart’s childhood tours, aristocratic admirers showered the prodigy with an array of presents such as silver snuffboxes, watches, bejewelled rings, miniature portraits, etc. 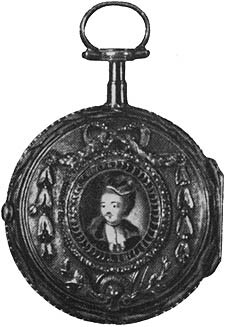 The Empress Maria Theresa gave a golden pocket watch, with her image on the front, to Mozart in 1771. From the time of Maria Theresa’s gift to the era of quartz watches, a curious reversal of roles took place between patron and artist. In an age of capitalist market values, of corporate images and advertising slogans, it is the face of the genius that sells, though the means of presentation remain essentially the same.